A game warden is one of the most interesting and rewarding careers you can have. This career offers the chance to serve the public, help wildlife, and preserve the natural beauty of our country. While many people assume an education and experience in law enforcement is the fast track to become a game warden, there are actually many paths you can take, including conservation and scientific educations. 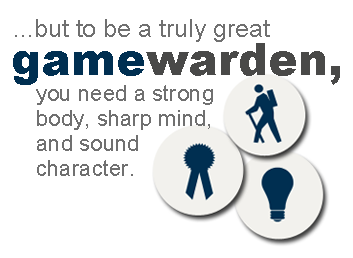 Like a police officer, there are requirements to become a game warden including physical abilities and background checks, but to be a truly great game warden, you need a strong body, sharp mind, and sound character. You also need a deep passion for the outdoors, as the job will push you to the mental and physical limits, all in the name of protecting wildlife and enforcing conservation laws. Think you have what it takes? Keep reading to learn more about how to become a game warden. Fish and game wardens, also known at conservation officers, are law enforcement officials who are primarily responsible for protecting fish, wildlife, and other natural resources. They are most often employed by the state they live in, but there are local and federal game wardens as well. A game warden’s primary responsibility includes monitoring fishing and hunting activities, including bag limits, techniques used, and monitoring various seasons for different game. For example, most states have turkey hunting seasons in the fall and spring. If someone is hunting turkey out of season, it would be the game warden’s responsibility to write tickets, confiscate equipment, or even make an arrest if warranted. Game wardens, DNR officials, and conservation officers are more than just protectors of fish and wildlife. They have the same authority as police officers and are authorized to enforce state laws just as any peace officer would. Game wardens can make arrests, write tickets, and seize property just as a city police officer can. They often assist with operations unrelated to hunting and fishing, especially search-and-rescue and surveillance operations. This is because game wardens are highly trained in outdoor skills like swimming, tracking, and hiking. As a game warden, interaction with the public is a daily part of the job. Game warden job requirements include talking with hunters and anglers to check for proper licenses, ensuring rules and regulations are being met, and making sure outdoor activities are done in a safe manner. Continuing with public interaction, game wardens are often required to conduct educational programs, including hunter’s safety courses, outdoor survival classes, and general conservation education. Because the majority of a game warden’s work is outdoors, the job description will vary by area. A conservation officer in a coastal region may be responsible for enforcing saltwater fishing laws, which would require many hours boating. A game warden in a wooded or mountainous hunting area, however, may need to walk for a majority of the day in order to monitor hunting activity. Complete basic training in the state you desire to work in. While every state has different requirements, the path to becoming a game warden is fairly universal. Most states require a person to be 21 years of age or older to become eligible for a game warden position, and some will require new hires be no older than 36 at the time of appointment. If you meet the above requirements, start thinking about your personality, interests, and background to see if you would would be happy in the life of a game warden. Just because you have never fished, hunted, hiked, or camped in your life does not automatically disqualify you from becoming a game warden. However, no matter what state you’re in, a background in the outdoors is certainly beneficial to this career. To get started, you should have a base-level knowledge for the principles and purposes of fish and wildlife management, as well as the fundamentals of conservation. Being familiar with state and federal conservation laws is also beneficial. Because you will be a law enforcement official, there are physical fitness qualifications to meet. You’ll work under any and all weather conditions, from scorching heat to teeth-chattering cold, and you should be comfortable with being exposed to these elements at any time. Game wardens must also possess high moral character, including honesty and unwavering integrity. Some states even include crimes of “moral turpitude” as part of their screening process. Turpitude is a legal term that covers crimes involving a lack or morals, including fraud, violent crimes, and theft of any kind. You will also need the ability to work without supervision. While game wardens and conservation officers will often work in groups and collaborate with other law enforcement agencies, including local police and federal offices, much of the work will be done independently. That said, you also need the ability to work in a team and follow instructions. The ability to work within a unit and follow the orders of superior officers will be essential to a long-term career in conservation enforcement. Game wardens also need the mental capacity to handle violent situations. During your career, you may come across situations where violent force is required to protect yourself or another individual. Like a police officer, knowing when and how to use appropriate force, and being comfortable and stable enough to handle these situations, will ensure success in a game warden job. Finally, you need a strong internal dedication to the importance of conservation. You have to believe that the protection of natural resources, including fish, animals, and plants is vital. Without this belief, you’ll lack the drive needed to take on the elements in the pursuit of conservation. With it, you have the foundation for a long career as a fish and game warden. While there is no nation-wide game warden education requirements or a specific game warden school, there are basic requirements that nearly every state upholds. First of all, most states require a bachelor’s degree in a related field. Some states only require an associate’s degree, but all will require at least a high-school or equivalent degree. When considering a game warden career, it will help if you have an education in a related field. 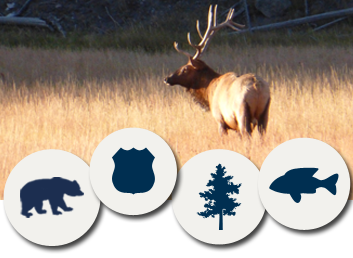 There are numerous fields of study that you can consider, but in general, you will find that wildlife officials have educational backgrounds in three broad areas. Because game wardens will spend much of their time and energy dealing with plants, and animals, a strong background in biology and related sciences can be very helpful. This will give you the ability to analyze scientific information related to habitats and provide a background for understanding the interaction between plants, animals, and human beings. A science-related education at larger universities usually requires a four-year commitment. As we discussed earlier, game wardens are more than just animal care-givers, they are fully-certified law enforcement officials with all the authority of a police officer. Therefore, an education that teaches law enforcement principles will be highly desired among game wardens. Many smaller community colleges and technical schools offer law enforcement training, making it a faster, more affordable option compared to the sciences. While there will be some obvious overlap with educations in biology and science, an education in conservation and resource management focuses more on maintaining and preserving plants, wildlife, and habitat. It will also give you a well-rounded knowledge on the relationship between humans, plants, wildlife, and habitat. If you don’t have an education in a conservation-related field, there are a few states that will recognize experience in the place of formal classes. This experience can include law enforcement, comparable military service, or work with natural resources. No matter what your educational background, you must complete basic training to be eligible for a game warden position. This is usually a six to eight month program that will include many of the skills necessary for police officers, including civil defense, driver training, physical training, first aid, emergency management, firearms proficiency, and more. Basic game warden training will also include natural resource and wildlife management education. When hired, a game warden may also need to complete field training, depending on the position. A federal game warden is required to complete 44 weeks of field training and evaluations, which will include working alongside experienced conservation officers. During field training, game wardens sharpen their skills in investigation and conservation laws. Specialized training will also be required for specific jobs in various states. Game wardens can complete advanced training in boat operations, aircraft piloting, commercial fishing enforcement, underwater search and recovery, and many more. Each state will have different specialized training packages depending on their needs. The demand for game wardens is expected to rise in the future, although it will not be a sharp rise. By most estimates, it will be a slow, steady increase, growing from 6,600 jobs in 2012 to an estimated 6,700 by 2022. While there will should be roughly 200 game warden job openings every year, there will be few new jobs created. A game warden is a highly desired position; after all, the woods, lakes, and coasts are your office. So while the number of new game warden jobs is low, competition is high. With only 200 new openings a year, each position is flooded with candidates. For example, in 2010, the state of Iowa hired 16 conservation officers from a total applicant pool of 540 individuals. Clearly it can be a challenge to land a game warden job, but with the right attitude and the right resume, it can be done. Once you land that position, you’ll have a rewarding career that will give you a lifetime of new and unique challenges. While a game warden career is not the fast-track to a wealthy lifestyle, it can be rewarding financially, especially for those at the top of the pay scale. According to information compiled by the Bureau of Labor Statistics (BLS) in 2014, the bottom 10% of game wardens make an average hourly wage of $15.70, while those in the top 10% make an average of $36.39 an hour. The average game warden salary is $24.46 an hour. Fish and game wardens are usually employed by either a local government or the state, and there is a large difference in pay scale between the two. The salary of a game warden employed by a local government only averages $20.27 an hour, with a yearly salary of $42,160. Their counterparts working for the state, however, average $26.14 an hour and an annual salary of $54,370. Clearly, if you are interested in making more money as a game warden, working for the state will be a more profitable career. It should be noted that there are almost ten times more state-employed game wardens (5,290) than local officials (530) according to the BLS. Location also makes a difference in your game warden salary potential. If you want to be a top-paid game warden, it appears that Illinois is the place to live. Statistics from the BLS say game wardens in the Land of Lincoln average $96,800 a year. California and Maryland conservation officers average above $70,000, while Georgia, North Carolina, and South Dakota game wardens average less than $40,000. This shows the vast difference in game warden salary by state.